Healthcare has a shared VALUE NETWORK that connects the supplier community to the operational stakeholders across quickly-evolving care settings. 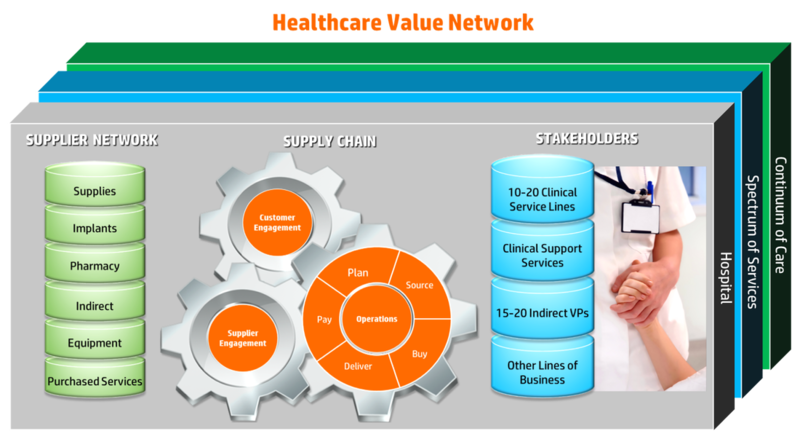 Provider's Supply Chain functions facilitate the interactions of this value network. The patients we serve throughout the country, whom are often experiencing their most vulnerable moments in life, depend on an efficient and effective value network. Unfortunately, the current value network has many bottlenecks, risks and inefficiencies. ​We could dig into symptoms, but we've been admiring the same problems for many years. It's time to paint a new vision for success. What if savings goals belonged to everyone in the organization? What if we never talked about savings without also talking about the rest of the value equation? You know...quality, service, outcomes and all of the benefits we receive in exchange for what is paid for goods and services. What if you could grow your team without ever having to ask for a resource? What if you could dramatically streamline the decision making processes? What if your team had the highest employee engagement levels in the entire company? What if you had a backlog of stakeholders calling for your services, not because your policy mandates them to do so but because of the extraordinary service you provide? What if suppliers willingly brought you their best resources, best ideas and best value proposition? What if 80% of your day was invested in truly strategic activities and the development of others? What if you were influencing the company's population health strategy and really had that "seat at the table"? What if your sales organization better understood voice of customer? What if your team knew how to build trust and loyalty while providers continue to merge? What if your organization could better anticipate your customer's selection criteria? What if you could deepen the relationship in ways that potentially eliminated bids altogether? What if your organization knew how to transition from feature selling to a solutions-orientation? What if your team knew how to facilitate customer advisory boards and to use the insights to inform your next actions? What if your team had a better understanding the GPOs, distributor, provider and insurer landscapes? What if providers knew who you were and understood you could credibly service their needs?